What is the Kozuka Koubou? 1. It is one part of a swordsmith process,but can experience plesure to make genuine Japanese sword. Sharpen it by hands and take soil and do it antil a process of quenching. The material is sand iron,fuel chacoal and is made of old steelmaking (TATARA) Tamahagene steel. 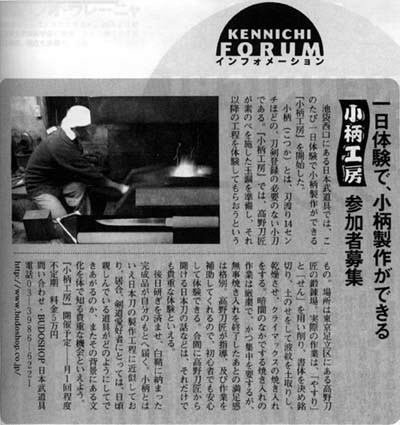 The instructive swordsmith is a true Japanese swordsmith (Katanakaji) who was accredited by the Agency for Cultural Affairs. 2.You can choose the skin among the cross grain (Mokume) or horticultural kind of Japan cedar (Aya-sugi plus 10,000yen). 3.A blade crest is small in straight, but it is a genuine Japanese sword. The beautiful skin and blade crest only by a traditional method of construction. 4.Polish a work, and put it in a plain-wood scabbard, and is completed about 3 months later at your hand. 28.Beginner's bookmark（movie）（March 2018） 29.Participant's youngest record renewal (December 2016) 30.
it is sorry that Iwe don't know "a handmade edged tool as a "tool". Try to begin to making knife "Kozuka" to need a lot of looking after.It obeys traditional technique of a Japanese sword. We prepared such an opportunity and a seat. Traditional industrial arts, "the Japanese sword" which became a work of art, and is going to survive the world are slightly difficult to approach and are expensive. Kozuka Kobou studio is a genuine sword studio to make happily. Begin work for noon and put a break, and, with guidance of a swordsmith, it is work for about 7 hours. A lunch, drink, a change of clothes, a muscular pain, some blisters, a burn are individual payment. I do not forget so army gloves, a towel either. Various tools surrounded "swordsmith studio", and is very fun "making a sword" , work to be polluted, but it is not wrong to "be considerably happy", and there are cut powder of iron, soot (soot) and sweat of charcoal. Skillful, and awkwardness is various, but a swordsmith helps with that indirectly. ○Would like you to understand it with a participation qualification beforehand participate man and woman more than age 20 years old ,The participation of minors (children over 12 years old) at Kozuka Koubo. We require written consent by a parent or guardian for people between the ages of 16 and under 20 years old. Children under 16 may take part if they are accompanied by a parent or guardian. For further information please contact us. Action work procedures please obey instructions of a swordsmith.